A photography exhibit at a coworking space-meets-art studio in Bishkek subtly but masterfully blends two of artist Elyor Nematov’s projects into a visual narrative on migration that balances the experience of several million Central Asians seeking work abroad and their families, who are left to grapple with the gap of absent parents, siblings, and children. Large prints of Nematov’s photographs hang in a busy hallway, leading the viewer past conference rooms and design start-ups to the office of Migrant Ishker, an organization providing training in business skills for recently returned migrants. Migrant Ishker is just one element of Kyrgyzstan’s dynamic entrepreneurial scene. Startup Weekend held an event last September for young women interested in building a business. Enactus Kyrgyzstan is part of a global movement to support young social enterprise; more than 200 students from universities across Kyrgyzstan build business plans that solve social and environmental problems. Startup Center in Jalalabad, also supported by the German Federal Enterprise for International Cooperation GIZ, offers trainings and workshops on building sustainable businesses. What sets Migrant Ishker apart, though, is its focus on the untapped potential of Kyrgyzstan’s massive labor migrant population. A faltering economic situation and increasing hostility toward Central Asian migrants in Russia could mean more and more labor migrants deciding to return to Kyrgyzstan in the near future. When these labor migrants return home, however, there is no formal support system to facilitate reintegration. Migrant Ishker is part of the effort to fill that gap; the organization functions within the framework of a global project on reintegrating labor migrants funded by the German Federal Ministry of Economic Cooperation and Development (BMZ). 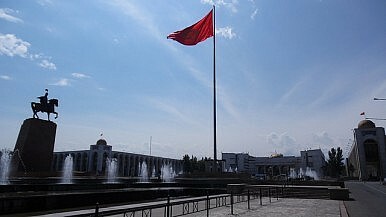 The decision to run a pilot in Kyrgyzstan was based on a study on the economic dimension of labor migration in Kyrgyzstan. The study found that labor migrants gain extensive experience and acquire new skills that should make them more attractive when re-entering the job market at home. “However, often those skills and experiences are not used in a strategic way,” Aichurek Zhunusova told The Diplomat. Zhunusova, who works as a consultant for the GIZ project, explained that without a formal institutionalized support structure, returned labor migrants’ economic potential is wasted. The reintegration project is targeting two separate channels: The first involves close coordination with state agencies to get official validation and formal certification of professional competencies acquired abroad, while the second is grounded in the private sector and supports reintegration through entrepreneurship. Migrant Ishker’s mission is grounded squarely in the second channel. At the moment, Migrant Ishker is targeting those who have already come back from working in Russia, Turkey, or the Gulf. Its staff recognizes the power of social media to facilitate a smoother reintegration process before a migrant even arrives back home. In collaboration with a Bishkek-based IT company, Migrant Ishker supported the creation of a mobile app, JUMUSH — the Kyrgyz word for work — to link workers and employers in Kyrgyzstan. While Migrant Ishker’s office is open to anyone who has recently returned from working abroad, the organization is currently focusing most of its attention on business courses for a small group of especially promising workers. The first cohort — made up of 23 participants from a pool of over 70 applicants — will start receiving training on basic entrepreneurial skills in mid-April. Most analyses of Central Asian labor migration focus on the reasons people leave, the hardships workers face in foreign countries, the risk factors for radicalization while abroad, and the economic impact of remittance dependence. Policymakers and academics know relatively little about the social and economic dynamics of reintegration in Central Asia, however. Migrant Ishker is pushing the conversation about Central Asian labor migration by drawing attention to the challenges and opportunities workers face when they come home.